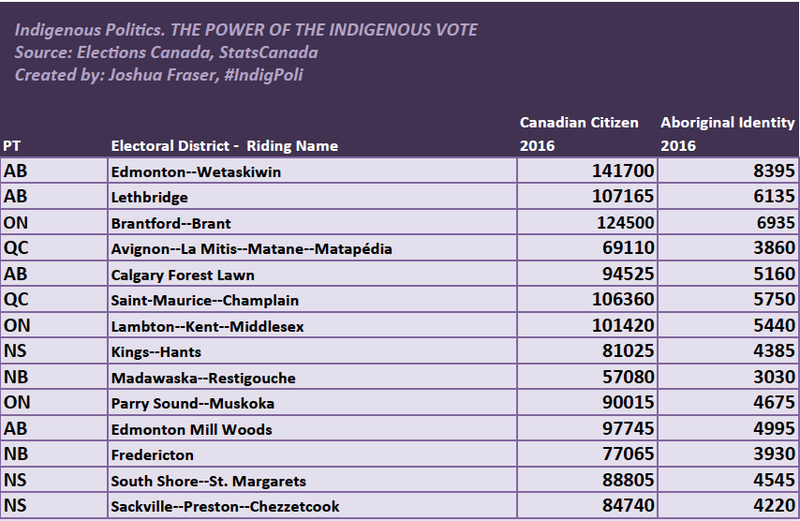 Indigenous Politics (#IndigPoli) is pleased to present our analysis on the potential and Power of the Indigenous Vote in the 43rd Canadian Federal Election which should take place on our before October 21, 2019. 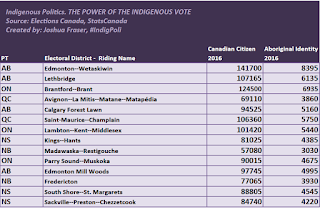 Background - You may recall that Indigenous Politics published the Power of the Indigenous Vote – Riding-by-Riding Analysis in 2015. We were pleased to see many Indigenous and non-Indigenous professionals and people utilize our information to get a feel for the REAL potential and power of the Indigenous Vote. We believe it was the first full riding-by-riding analysis done by an Indigenous organization. 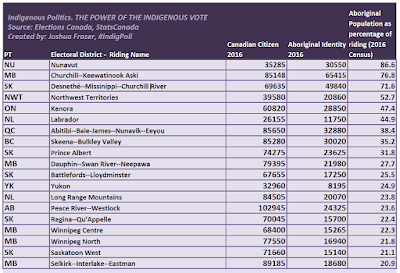 In addition to the 2015 analysis, we also had the more comprehensive and up-to-date catalogue of Indigenous Candidates with support from Pundits’ Guide, parties and individual partisans and pundits. We profiled these Indigenous candidates from all parties and did several ridings to watch profiles, where the Indigenous vote and Indigenous candidates were major factors in the riding races. It was also important that in addition to talking about Indigenous voters and candidates, that we address real challenges Indigenous voters faced in exercising their rights to vote, this included getting around barriers that many felt were created by Fair Elections Act 2014. Indigenous Politics collaborated with form federal Indigenous candidate Tania Cameron and others to develop an Indigenous Voters Guide to assist Indigenous voters to map their way through the system and cast their vote. 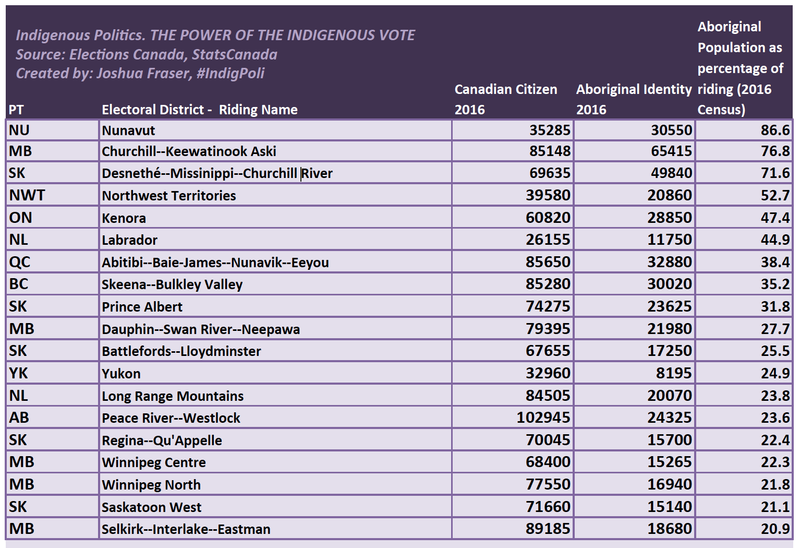 The Power of the Indigenous Vote in 2019 with be a force to reckon with, politicians who don’t pay attention to Indigenous peoples, communities and issues, do as their own peril. 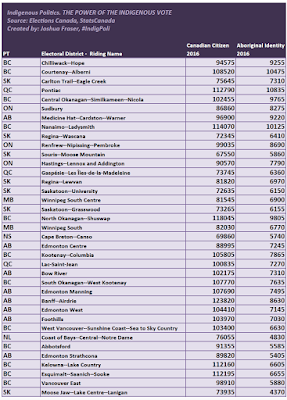 A note on Methodology: We compared the Aboriginal indenity against that of the Canadian itendity for our numbers and analysis. 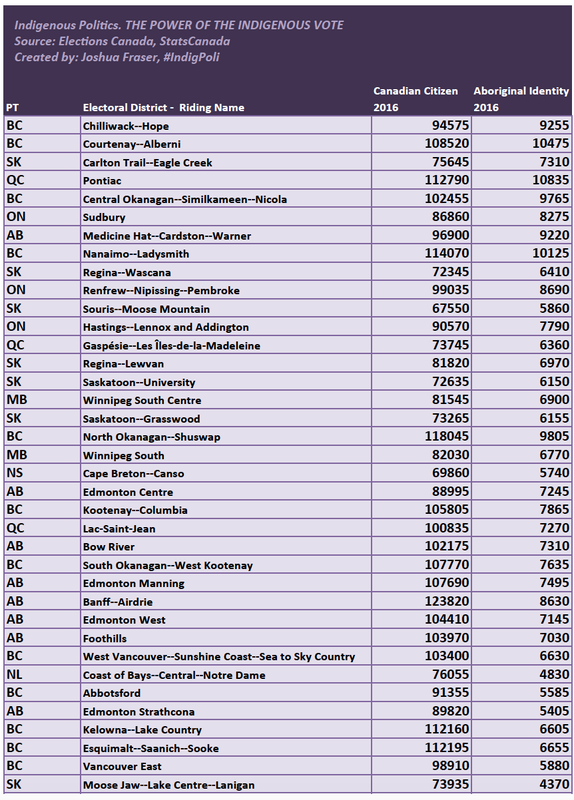 Even though we may have a higher Canadian population, only Canadian Citizens can vote. The Good Stuff - The Numbers! For the moment, we will focus on the milestone numbers. 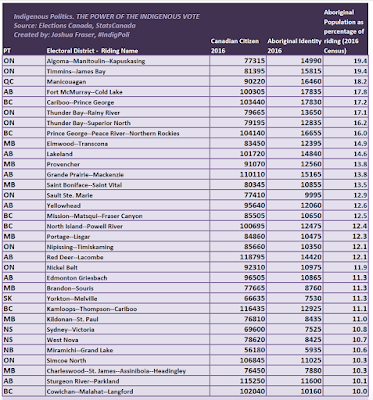 The ridings between 5% population to having Indigenous peoples as majority in the riding. 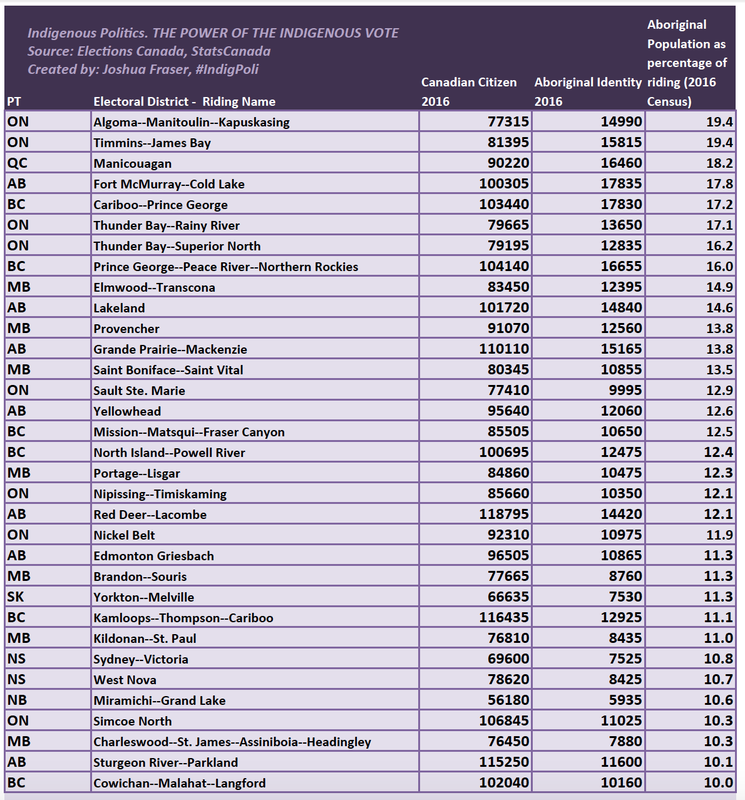 These are all ridings that can be influenced and even swing the vote in favour of their preferred candidate. Riding-by-Riding analysis will becoming very soon. We will also be considering other ways to slice and dice the data we have and to adding new analysis initiatives. Stay Tuned - New Analysis Coming Soon!